The Value of Working With Us - Southwark Metal Mfg. Co.
At Southwark Metal Manufacturing Co., our mission is to ensure the highest value for our customers’ dollar, by providing the quality of product, service, and industry support. 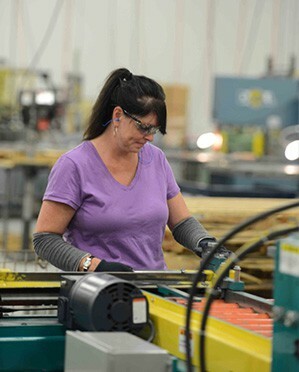 Our enthusiasm for continuous improvement runs throughout the company, from our management staff to our production floor. At Southwark, we strive to exceed the highest standards of the HVAC industry, and we guarantee your satisfaction with our quality workmanship, on-time delivery, and personalized service. Southwark Metal maintains a large fleet of company owned trucks and company drivers who service our distributors across the United States. We employ a weekly delivery schedule to efficiently and effectively meet all our customers’ needs in a timely manner. With a fill rate that consistently exceeds 99%, you will never worry about lost sales because of back orders or long lead times. Each of our six facilities has a staff of highly trained, experienced customer service representatives available to assist with all of our customers’ needs. Southwark Metal service representatives can access inventory, answer questions, and process your order promptly. Our factory direct sales staff is proud to partner with our distributors and is committed to assisting with your changing and growing needs. Southwark Metal has always been committed to meeting your HVAC needs through our quality product line, but we are set apart from other manufacturers by our determination to go the extra mile for each and every one of our customers. With our in-house IT staff, we are able to provide our customers with the latest in technology from price files and catalogs through email to EDI invoicing. Southwark Metal continually addresses the new requirements and applications that arise in our changing marketplace, and will work with you to ensure that your fittings comply with all industry standards and codes. Our training program can assist you and your staff in gaining a more thorough understanding of duct systems. Our classes are certified to grant NATE continuing education credits and are provided in-person by a highly experienced Southwark instructor with an extensive technical background. We take pride in providing you with the best service to help maintain and grow your HVAC business.